In Alaska, it seems we are often looking for new ways to gussy up salmon. And when the days are warmer, chilled salmon dishes are often my go-to. I recently tried a combo of a layered dip and a classic fish mousse set in a mold. This is a very forgiving recipe because you can use any kind of cooked salmon; for testing (and tasting) purposes, I used both smoked and leftover grilled gochujang salmon. Then layer in lots of fresh herbs and serve with vegetables, which we have in abundance in our gardens and at our local farmers' markets. Just make sure to allow enough time to chill the dip so it sets up properly. Try with a chilled rosé or dry riesling or chablis. Line a 6-inch, deep bowl or mold with plastic wrap, leaving a bit of hangover; set aside. 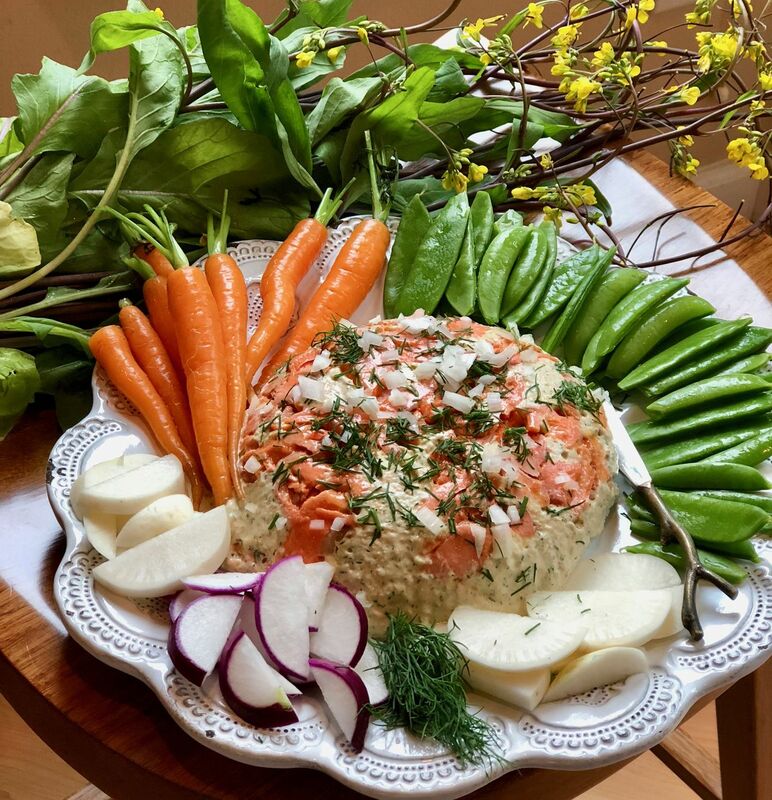 Combine cream cheese, goat cheese, horseradish, garlic, smoked salmon, lemon juice and zest, dill and black pepper together in the bowl of a food processor; blend until creamy and well-combined. Taste and add more horseradish or pepper, as desired. Break apart leftover cooked salmon and place in a single layer in the plastic wrap-lined bowl. Spread one half of cream cheese mixture over the cooked salmon. Top with a layer of fresh chopped herbs, onion, and capers. Top with remaining half of cream cheese mixture, smoothing with a flat spatula or back of large spoon. Fold wrap over dip and place in refrigerator to set, at least three hours or overnight. When ready to serve, unwrap plastic and place a serving plate over dip. Flip and remove bowl and plastic wrap. Garnish with more fresh herbs and serve with fresh vegetables and crackers and more hot sauce on the side.